I’d like to introduce you to Reggy. She is, as you can see, very likely the cutest dog ever. 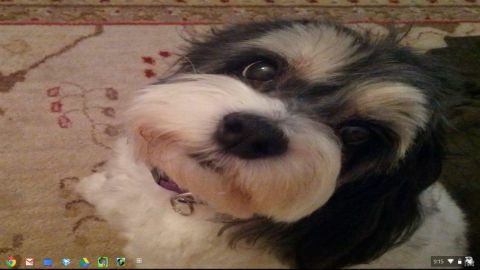 And it’s a good thing she is, because Reggy is the desktop on my shiny new Google Chromebook computer, and I can’t cover her up with icons. If you’ve used pretty much any computer using pretty much any operating system in the last couple of decades you’ll probably be struck by how clean my Google Chromebook desktop is. Is it because my Google Chromebook is new and I’ve not yet littered it with icons from all my programs, or stored frequently-used files right there in plain sight for easy use? Yes to the first part of the question, but no to the rest. In the latest version of Google Chrome (the operating system, not the browser), you can’t put anything on your desktop. And that’s probably the most important thing I can tell you about the Chromebook. It . . . is . . . different, REALLY different. The Chromebook is perception/realty shifting business change of the highest order. And you’d better get ready, because this kind of change is in your future. I picked up a Chromebook this weekend at my local Best Buy. I’m no fan of Best Buy, but after I convinced the salesperson there that I was worthy of one of the very few Chromebooks they had in stock I was able to lay my hands on one. It really does cost just $250. It really is a laptop that is the same size as a MacBook Air, but weighs a pound less. Its keyboard, although missing a few keys I’m used to and it turns out I use quite a bit, feels surprisingly good to type on, unlike my now-retired Acer Netbook. And its performance is, I’m not kidding, great. I have no complaints about the Chromebook, except that because it’s made of plastic it feels like it might not hold up to uncareful handling. Oh . . . and that using the Chromebook makes me have to re-think some things I’ve done the same way since around 1991. That last point would be a deal-breaker, and should be, except for a simple reality that we’ve been moving toward for a couple of years now. The old paradigms controlling how our computers work are changing. I sat down at my Google Chromebook today to write this piece about the Google Chromebook, and it’s been harder than I would have liked. I had to find a way to capture and edit that picture of my desktop. I had to figure out how to get the picture to Answer Guy Central. I had to learn new ways of making copy/paste happen. None of these things were actually difficult, but using Chrome as an operating system in place of Windows, with a keyboard lacking an “insert” key, took thought. Making file transfer to the Answer Guy server took thought. Editing Reggy the Dog‘s desktop took thought. And unlearning decades of Windows computer muscle memory wouldn’t be worth the effort, except that Microsoft is making that happen with Windows 8, anyway, and one day soon I’ll have no choice but to “upgrade”. Some things about that are great, actually. Because an extended version of Google’s Chrome browser is the entire operating system in the Chromebook, the chance of ever having a computer virus burrow its way into your computer is reduced almost to zero. We’ve been headed in this direction for several years, and the Chromebook is the first computer to ‘make the browser the operating system’, for real. And while the Chromebook has a few gigabytes of storage on-board, using it can feel clumsy and defeat the purpose: you want as much of your stuff as possible in The Cloud. In fact, this actually answers the question of who backs up your data when there are no files. I asked my fiancée whether having to change the way she uses a computer bothered her. She’s a unique case; she recently switched from a Mac to a PC because we had a Dell laptop gathering dust and her Macbook had started developing problems. She was a staunch Apple person. She adapted. She also just started using a SmartPhone—in fact, an Android device, not the iPhone she thought she’d like. She adapted to that, too. But I also asked some other people, and they felt differently. Change? No way; I hate change! Most of us hate change. But change is being designed into our computing devices, and some time soon you’re going to encounter it. The question is, will you deal with change by kicking and screaming before you have no choice but adapt, or will you face change head-on by switching to a computer like the Google Chromebook proactively? You know which choice I recommend. And of course, you know how to reach me if you want help. Ah, well, it depends on what that change is. I’m very interested in the Google chromebook, but there is one thing that worries me about it, and that is the apparent attempt to shift from a purchase business model (I buy my computer, and it is mine to use) to a subscription business model (the utility of the chromebook is greatly increased with a Google Drive subscription). If I go for a chromebook, and end up really liking it, am I going to end up paying a lot more on a Google Drive subscription than if I bought a more traditional computer? The market seems to operate fairly well in terms of driving down the cost of hard drives to store data, but how well would a market in cloud storage operate to keep prices down there? Timothy, I see we look at this from the same side. As a counterpoint, though, take a look at this reader comment, where Aaron points out correctly that you don’t HAVE TO pay for your storage space when the two years are up. And if you REALLY drink the Google Kool-Aid, he’s right. Change, baby . . . it’s all . . . changy. Jessica, you are of course correct; there will be options for when your Chromebook free storage expires. My point was that lots of people won’t think that through, though, and this is Google’s stealth entrance into a market that they want to start infiltrating. Google Drive storage is pretty cheap for what it is anyway. It is about 1/2 the price of similar services. Some cloud storage is cheaper to store and more expensive to retrieve like Amazon Glacier. No argument here, Ian … 100 GB for $60 per year is kind of a bargain. My only point was that Google stealthed their way into it. Great post and chats. I am seriously considering purchasing the ARM Chromebook so the comparison and comments from others have been of great help. Still pending is my “smart phone” selection. If I get the android phone will I be able to sync-up with chromebook and benefit from this capabilities like the owners of Galaxy? Thanks in advance and happy T-Giving to all! If you mean “will my Google account details transfer back and forth between the Google Chromebook computer and my phone?” the answer is yes, and you don’t have to do or know anything. But the Chromebook isn’t running Android, so you need Chrome/browser apps to access that information; you won’t use Android apps. And that, I’m happy to say, is no problem, either; everything I’ve needed exists in both worlds. The one and only issue I’ve had is that I can’t plug my Nexus 7 into the Chromebook, because it has no SD card/drive that gets addressed AS a drive. That means that you either need a phone with external storage (which should work), or you need o transfer using a utility like AirDroid, which overcomes these problems, but is slower ans requires an extra step. Thanks Jeff !!! What about 3G option. It appears the only one available with ARM Chromebook is from Verizon. Does Samsung plan to offer a 3G capability where customers will be able to chose their own service provider? Or am I missing something with the way exiting book is packaged? Jeff, thanks and let me impose on your expertise one more time. Here is what I am trying to accomplish. I am on fixed retirement income and want to cancel my pricey Verizon FiOS triple play bundle. For new TV service I plan to get DirecTV, and will drop my land line phone service and FiOS internet. My challenge is to figure out my internet access options. I was thinking to pick-up a new wireless service provider and get a smart phone. I am leaning towards Android-based phones. I have a one-year old laptop at home with WiFi built that my wife uses often. I need a devise for myself and the may reasons I am interested in new Samsung Chromebook ARM is the benefits “cloud” computing offers. Also, with built-in keyboard if gives me the feel of what I am used to using, the laptop. I am not considered other options like tablet, etc. From my research it appears that “hot-spot” approach gives me the best (cheap) internet access. Am I right with this assumption? If yes I need to select a wireless provider that charges the least for turning my cell phone into a “hot spot”. Can you suggest / advise on these or any other points I overlooked? -Which wireless providers charge least for enabling hot-spot feature on the cell phone? -which smart phone should to get and should it be 3G or 4G? -can my old Toshiba with its build-in WiFi access the internet via my cell phone hot-spot? -And am I on the right track with looking at Chromebook or should I consider another device? The new device will mainly be used for web-surfing, doing online banking and finance, some entertainment like watching free movies and this I would like to be able to display on my plasma TV via HDMI connection. The Chromebook, the Chrome OS, and Google cloud services seems very attractive (safety, simplicity, ease of use, etc). Slobodan, that’s a lot to ask me to . .. umm . . . take responsibility for. In my experience, if you know how to tweak things you can get a pretty decent package for everything you need by getting unlimited data from someone (harder than it used to be), and using a hidden Hotspot in your phone, such as FoxFi, to make all your other devices work. Please understand, though, that if you get away with that you’re still likely breaking the rules from your Wireless carrier; I can’t address how you’d feel about that. I appreciate (for real) how expensive bandwidth can get when you start adding it to all your devices, but with that said, I hear you call your FIOS bundle expensive and my ears perk up. I have FIOS at my home as well, and the $100/month or so I pay them for fast Internet plus TV and a phone line feel like a not-bad deal. Add what I’ll just call “$50/month” for unlimited portable data from someonelike Clearwire, and I hear “good deal”. It’s really a lot of stuff to tie together, I know, but that’s about as good as I can do in good conscience at this level of discussion. The Chromebook weighs slightly more than the 11″ MBA (2.42 lbs vs 2.38 lbs). The 13″ MBA (larger form factor) only weighs 0.54 lbs more than the Chromebook. “It works correctly”. Sort of. I’ve connected my Samsung Chromebook to a 1080P LED TV via HDMI, and it did send a signal over, both audio and video. Which is to say that the TV became the replacement video monitor and audio output device for the computer. My desktop showed up, albeit with some interesting color glitches, probably owing to the difference between the 1366×768 resolution of the Chromebook monitor and the 1920×1080 of the TV. That said, when I streamed a Blu-Ray-quality .MP4 movie over that connection, everything worked, perfectly acceptably. I’ve heard about “iffy” HDMI support, too, but obviously didn’t have the same problem. HOWEVER, I will say that you have to be careful about video formats. AVI works, but it’s kind of glitchy. WMV and its variants are even worse. If you stick to H.264 (.MOV/MP4, etc. ), The Chromebook works fine, and since I got a solid-enough desktop replication I’m going to guess that people who have had problems had them not so much with HDMI as with their video encoding. File suffixes .avi, .mp4, and .mov only represent containers. Ian, you’re correct, but in practical terms what I wrote was, too. And I mentioned H.264. Most people will find that files with MOV or MP4 extensions will work, while others will be troublesome. Happy holiday season to all !! !